When you neglect to brush, plaque builds up on your teeth. This plaque can harden into calculus, which irritates the gum tissue. Accumulated plaque also affords bacteria greater opportunity to collect on the teeth and gums, eventually leading to gum disease. Gum disease is an oral condition caused by bacteria that naturally inhabit the mouth. The bacteria infect the gum tissue, causing bleeding and inflammation. Without treatment, gum disease often results in gum recession as well as bone loss and the potential for tooth loss. Fluctuations in hormone levels can result in gum recession. This is due to the fact that hormonal changes like those experienced during pregnancy and menopause can increase periodontal sensitivity, causing bleeding and inflammation. Crooked and crowded teeth can be difficult to keep clean. Depending on the severity of your condition, it may be impossible to brush or floss in between teeth. This can lead to both cavities and gum disease. In addition, misaligned teeth can produce an uneven amount of pressure on teeth, resulting in gum loss over time. Invisalign braces can help correct these problems. While piercings are becoming more popular, they can lead to gum recession. If your oral jewelry comes in constant contact with your gums, it can wear away healthy tissue. Gum recession is a serious oral condition that requires evaluation and possibly treatment if prevention fails. 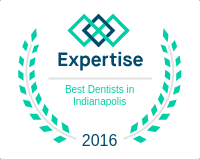 To schedule your consultation in Fishers, IN with Dr. Behner, contact our office today. He and his staff are here to help if you are in the Indianapolis area, including Fishers and Carmel!